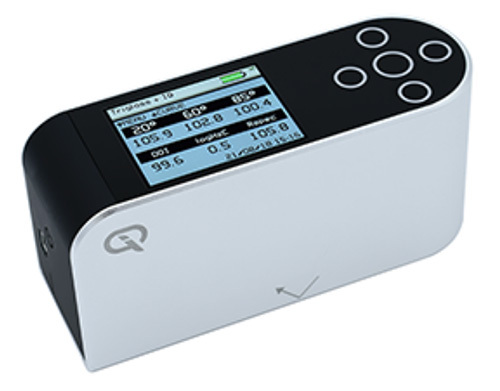 The Rhopoint IQ measures reflected image quality; it is the only hand held instrument that profiles how light is reflected from a surface. Glossmeters are usually used to measure the "shininess" of a surface but are not sensitive to common effects which reduce appearance quality. Click here to read article on Enhanced Surface Quality Measurement. Software-free data transfer. USB connection to PC instantly recognizes the device as a drive location which facilitates the quick transfer of files using Windows Explorer or similar. PC & MAC compatible, no software install required. Instantly transmit measured readings directly to programs such as MS Excel on your PC / tablet smartphone to greatly simplify the reporting process. whilst charging. Rechargeable Lithium Ion and >17 Hours operation. Recharge time mains charger 2.5 Hrs. Adjustable brightness 6 Button touch sensitive interface. Orange peel dramatically reduces appearance quality without affecting gloss readings. 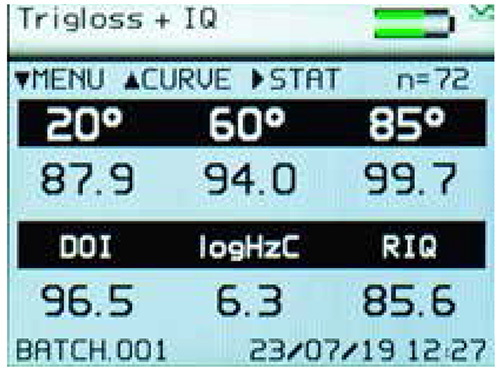 These two test panels measure identically with a standard glossmeter. The Rhopoint IQ with RIQ/DOI measurement can quantify the differences. Haze is a common problem associated with coatings and polished materials. Surfaces with haze have a "milky" finish with a "shallow" reflected image. This important characteristic is directly measured with the Rhopoint IQ. Gloss is a measurement proportional to the amount of light reflected from a surface. Geometry: The correct measurement geometry should be used according to the sample finish - Matt: 85°, Mid Gloss: 60°, High Gloss: 20°. RSPEC is the peak gloss measured over a very narrow angle. Usage - is very sensitive to surface texture and can be used to identify subtle differences in smooth surfaces. Reflectance haze is an optical effect caused by microscopic texture or residue on a surface. Variable Symptoms: A milky finish is apparent on the surface with a loss of reflected contrast. Halos and patterns can be seen around reflections of high intensity light sources. Causes: Poor dispersion, raw material incompatibility, additive migration, vehicle quality, stoving/ drying/curing conditions, polishing marks, fine scratches, ageing, oxidization, poor cleanliness/surface residue. Reflectance Haze Compensation - The instrument compensates for reflection from within the coating for highly reflective pigments, metallic coatings and speciality pigments, allowing the haze of any painted surface to be measured. 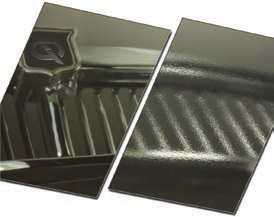 Reflected Image Quality (RIQ) is used to quantify effects such as orange peel and surface waviness. 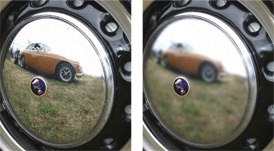 This new parameter gives higher resolution results compared to Distinctness of Image (DOI) measurement and better mimics human perception of surface texture, especially on high quality finishes such as automotive. Symptoms of Poor RIQ: Orange peel, brush marks, waviness or other structures visible on the surface. Reflected images are distorted. Causes: Application problems, incorrect coating flow, coating viscosity too high/low, sag or flow of coating before curing, incorrect particle size/distribution, overspray, improper flash/recoat time, inter coat compatibility, incorrect cure times and cure temperature. CLICK HERE to learn more. DOI is a measure of how clearly a reflected image will appear in a reflective surface. Concrete Clarity is the visual appearance in which a reflection is seen in polished concrete. Using the Rhopoint IQ Concrete Clarity Meter (GL-213721) the user can define Reflective Clarity (Reference ASTM D5767) , Reflective Sheen/Gloss (Reference ASTM D523) and Haze (ASTM E430). Please reference the Concrete Polishing Council technical documents which can be found HERE, these are established specifications and guidelines that the CPC has worked closely with industry to establish.